New Jewel-Osco Coupons in Thanksgiving Handbook | A Savings WOW! We received Jewel-Osco’s Freshly Made Holiday Thanksgiving Handbook in the mail yesterday and it’s full of tips, recipes, and Jewel-Osco store coupons. 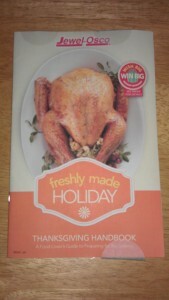 You can find the recipes in the Freshly Made Holiday Thanksgiving Handbook on Jewel-Osco’s website. Sign up for Jewel-Osco’s free Preferred Card and be added to their mailing list for these great coupons!